Stefan Baumann Archives - Art Matters! “studio” with you everywhere you go. that are used together to create the amazing photos that your printer can print. 1800’s and despite that limitation, they were very successful. patience, you can mix these three colors together and create a beautiful black. trunk of your car but go on site with as little as you can carry in one trip. Remember that White is not a color and is only used to create values of a color. mix some linseed oil into the paint on the palette. like buying oil primed linen canvases to paint on. you are free to paint where ever and when ever you want. The post Choosing Your Own Color Palette appeared first on Stefan Baumann – The Grand View: Paintings by Stefan Baumann. At our camp near Coulter Bay, on the boundary of the Teton National Park, there was a curious bear whose name is Number 399. When I captured my first glimpse of Number 399, I grabbed my sketchbook to make a quick sketch on paper knowing that I could later transfer it to canvas. The bear stood for a few moments among several fallen tree trunks before lofting away to another campsite. While he stood there, a burst of wind made his fur ripple like waves on water, back-blowing his thick winter coat. The National Park Service gives bears numbers to identify each bear, keep track of their activity, and to monitor if any bears are interacting with park tourists in an unpleasant manner. Every bear has its own personality and interacts differently with members of the human race. Number 399 is a popular bear at the campground. Rangers and park visitors liked him because of his natural curiosity about people, and as a result, many park tourists enjoy seeing this beautiful four year old, honey-colored grizzly. He likes the attention and poses for pictures, and he has never been cited for unruly bear behavior, although his natural curiosity makes a few campers a little uncomfortable as he wanders from campsite to campsite. The following day after I sketched Number 399, I learned that a hunter, who had just killed an elk, shot the curious bear three times and killed him. The hunter apparently was worried that he might have to share his kill with the bear. This was a poignant reminder of the value of sketching in the moment as the opportunity presents itself. Artists have not always carried their paints and canvas with them on their travels. The practice of painting on location is a relatively new concept in the history of painting. Many artists prefer the traditional method of sketching their experiences in a sketchbook. Artists can draw models or objects of interest, jot down notes and observations about a subject’s shapes, colors and unique features, or work on ideas for upcoming paintings in their sketchbooks. 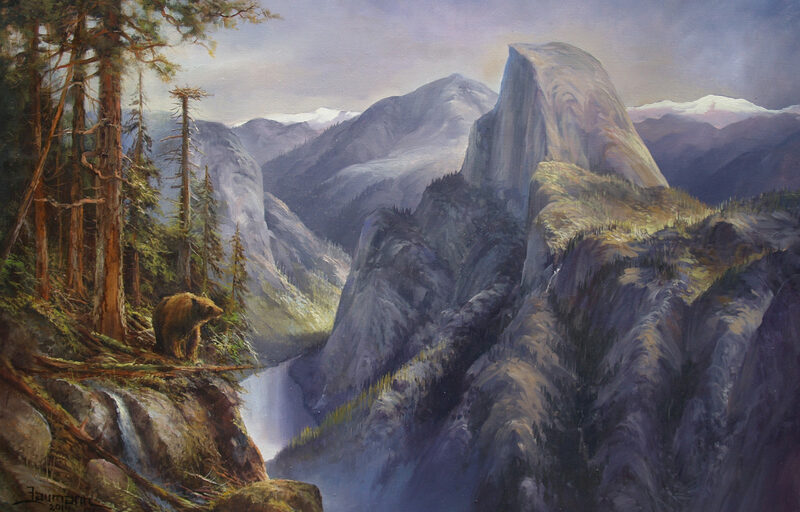 In this painting, “Curious Bear,” I worked from a sketch that I drew of the bear that visited our campsite. Having only seconds to jot down ideas, I worked on an idea for a painting from my sketchbook and notes the following day after I learned that the bear had been shot and killed. This is an example of why it is valuable that artists always have a sketchbook and a pencil or pen ready to sketch and write notes and observations. I recommend using a book that has about 50 sheets of plain paper with a spiral spine, and urge artists to carry it with them everywhere and make a point to draw at least three drawings a day. It is not necessary to invest in expensive journals with upgraded paper and leather binding displaying the artist’s name in gold leaf. Although these can be impressive, the fancy journals are intimidating and rarely, if ever, used. Don’t think of your sketchbook as a holy relic. It is just a book with pieces of paper. The real value is not the book itself; it is using its pages to practice your sketching and to journal what you are thinking and feeling daily about the world around you, with the possibility of capturing a precious moment that later can become your next great painting. The post Sketchbooks, Valuable Artist’s Tool appeared first on Stefan Baumann – The Grand View: Paintings by Stefan Baumann.